Different areas of the country have varying tastes; soybean drilling is more popular in same areas and less popular in others. As I travel around the country, trends appear as different planting methods cycle through one area and move on to the next. Recently, I walked through a drilled soybean field which was heavy with vines but had very few flowers and absolutely no small pods. The stand was in otherwise excellent condition and early season planting factors were quite favorable. But the current situation was quite dry and it looked to me as though there would be few beans produced as all the available soil and nutrient energy had gone into plant growth and there was not enough energy or nutrient left for flowering and seed production. The bottom line to this whole problem was that too many plants had established and there was not enough nutrient energy to finish out to seed production. I see this quite often as people go to narrower rows first then drilling and then solid seeding. In each case it looks good on paper and possibly the first year or two it does a little better than before, but it doesn't take long until the yields peak and then start to decline. 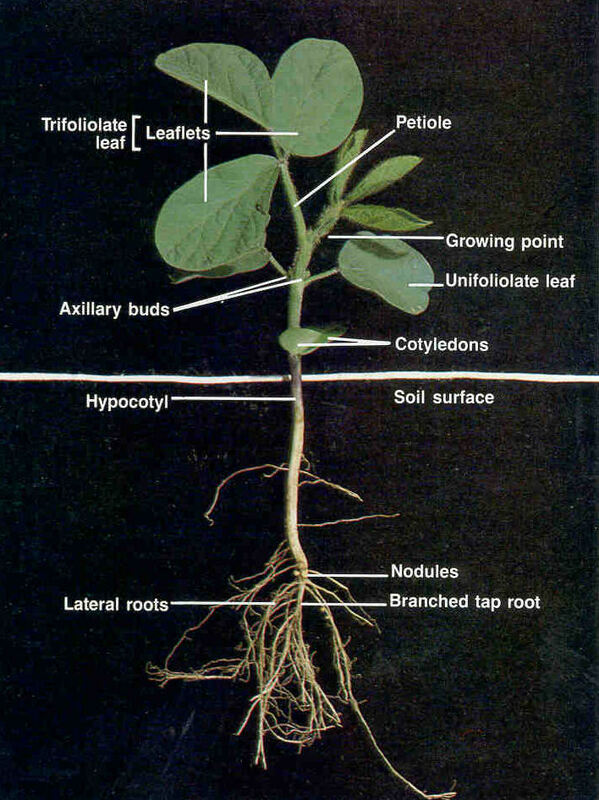 I ran a soil test on the soybean field with mostly vine and leaves and it confirmed what I observed visually. The soil had no tilth and little or no organic matter. The major problem with this field is too little energy based upon the Ergs test. The nitrogen, phosphorus, calcium readings also were much too low to support the existing crop so nature responded by aborting flowers until enough energy arrived to finish seed development. Aerial spray with 5 gals. water. If enough energy doesn't arrive at this point in plant growth, the yield is greatly reduced - or doesn't increase - and that is often why it doesn't work to drill or solid-seed beans. One of the reasons that so many of these management practices are tried and fail is because people don't address what is really going on in the soil. 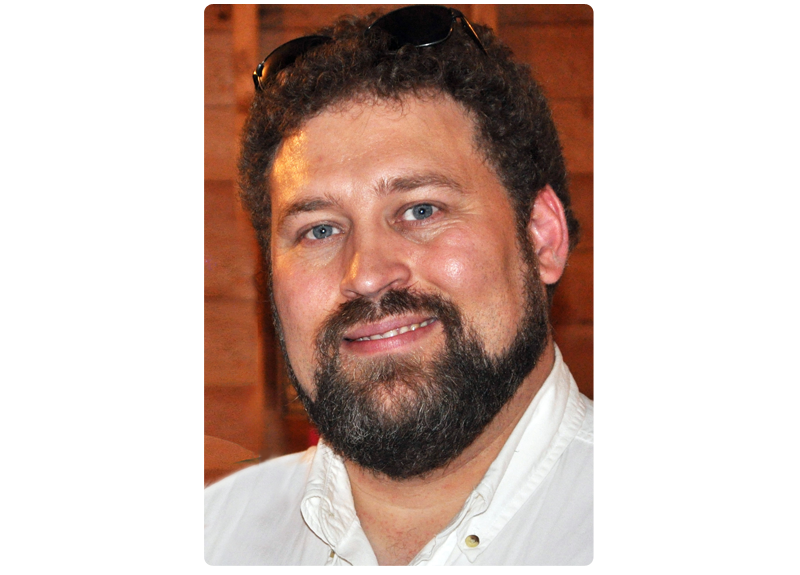 Few farms have a soil management plan to guide them. When the Ergs readings drop too low, yields are reduced; I have seen this over and over. It is especially true when the calcium readings are below 1500 and the phosphorus readings are below 140. Keeping the Ergs up can be a very challenging job, and in some soils it can cost more than the crop is worth. It takes time to build a run down soil back up to sustain good economical crop production. The development of good phosphorus, calcium and humus levels is the key to maintaining adequate Ergs levels throughout the growing season. The Ergs test measures the electrical current flow of soluble organic and inorganic salts in the soil, When the level drops too low, crop production goes into a holding pattern or declines drastically. It is not always easy to know what to add in order to get the Ergs readings to go up, but sometimes plain old table salt can do a fine job at 2-5 pounds per acre. This is true if the sodium reading is under 20 ppm. I have found a 20-20-20 dry water-soluble fertilizer lately which when used with l/2 pound of magnesium sulfate and 1-2 quarts of RL-37 does s nice job of raising Ergs levels and setting flowers and pods on soybeans. Spraying this mixture once or twice really sets flowers and pods and shows up well on soil Ergs readings. The problem will be whether it translates into an economical return in the end. I am trying some of these blends on my own soybeans and the flower and pod setting has greatly improved; I just hope it converts into more bushels per acre. We have had a lot of rain in my area and the Ergs in many fields are below 100. I have checked some fields that are even below 50 Ergs. Another plan I have formulated uses 1-2 gallons of ammonium thio-sulfate, 5 gallons of liquid calcium plus 2 quarts of liquid humate knifed down in between the soybean rows. So far the Ergs have been staying above 200. I have one account spraying 10 pounds of sulfa N-45 -a solution-grade ammonium sulfate over each acre. I know that if I can keep the Ergs level up, the yield will be better than where I don't. The question is: will I get enough more beans to pay for the extra product used and my time? I would not spray the sulfa N-45 on low calcium soils (soils with readings below 1000) unless I added liquid calcium at the same time. The economics of all these ideas may be in question, but what are the benefits of buying a new bean drill for a soil that cannot support the plan? I spent two weeks inPennsylvania, Ohio and Indiana not long ago, and all I saw were soils low in humus, phosphorus and calcium. I would like to know what the economics of this will be when we face the fact that we must change or improve these soils. I have a few farms in their areas that have been working with my programs for several years, and several of those farmers told me that, the way things are currently going, this year alone may pay for the extra time spent putting these programs together. The reason for their confidence is that their crops were handling weather stresses much better than their neighbors - a fact which was quite evident from the road. The more active humus, organic phosphorus and soluble calcium in a soil, the better the crop will tolerate disease, insects and weather stresses. I have watched several farms in my area replant soybeans three times this year because of fungi and mold infestation. Many other fields have greatly reduced stands due to the fungi infestations from cold, wet soils. Diseases such as rhizoctonia, pythium and fusarium to name a few, have really hurt many soybean fields. Then add cyst nematodes, spider mites, and grasshoppers in some areas and the challenges of soybean production get really interesting. Rhizoetonia root rot is becoming more of a problem in many areas I have been to, and the use of 2 pounds of copper sulfate sprayed on the field before planting can really help this problem. Rhizoctonia is often first noticed by the presence of wilted and dead plants. This problem can range from mild to severe and can thin out stands. The fungus infects young plants when the soil is wet and the temperature starts to rise. Typical symptoms include the decay of lateral roots and localized brown to reddish brown lesions on the hypocotyl - the stem area just below ground level. The reddish brown color is a good symptom to aid in diagnosing the disease. The reddish brown color fades quite rapidly after removing plants from soil, so you will need to check for the color at the time of removal. The color is usually limited to the surface tissue of the main root in the hypocotyl area and does not extend further into the root or stem. The disease normally affects younger plants, but it may affect older plants when they are under moisture stress since the hypocotyl area may be so badly damaged it affects nutrient uptake. I have seen many fields with this problem and I see a lot of plants stunted from its effects. I believe it is helpful to spray copper sulfate early to prevent this problem. After the problem has occurred, cultivate as much dirt as possible up around the plant so that new roots can be sent out above the hypocotyl. By cultivating and foliar spraying you can overcome this problem, but prevention is the best program. I can't stress enough the importance of walking your fields to check your soybean plants throughout the growing season, taking corrective action as needed and keeping good notes as to what is happening. In at least 60 percent of all rhizodonia cases that I see, the Ergs levels are below 100 and often below 50 -conditions highly favorable for this fungus. Of all the soybean diseases I see, I think this one has a lot more to do with reduced yields than many of the others. Rhizoctonia is a common soil fungus that grows on dead plant material. If you have a problem like this, I could make a good case for covering crop residue to compost it faster and have less trouble with rhizoctonia. In fact, nearly all of the fungal diseases of soybeans can over-winter in crop residue. Fusarium root rot is another fungal disease that can really hurt plant population and often cause replanting. The problem may start with poor seed, but not always. Adverse factors that can cause the problem include heavy rains, soil compaction and soil flooding after planting. Soil compaction really has a lot to do with fungal disease because aerobic bacteria are what keep many of the fungi in check in a soil. If the aerobic bacteria cannot function, the soil becomes unbalanced and more susceptible to diseases such as fusarium root rot. Symptoms of fusarium root rot include poor germination, late emergence and stunted plants. The fungus causes dark brown lesions that are confined to roots and lower stems. Plants that survive infection will wilt during moisture stress. This disease is best managed by planting in well aerated soils with active aerobic bacteria and good, clean seed. If you are having a problem with this fungi, I would recommend fall tillage, liming and correcting nutrient levels and ratios. I would use extra nitrogen and sugars in the fall to speed the breakdown of crop residue. I would plan a program to keep the soil Ergs up and get rid of soil compaction as fast as possible. These are a few of the things you can do to help keep this problem under control and at the same time get better soil tilth and aeration. Pythium seedling rot is a fungal disease that can occur on soybeans at any time after seed is planted. Seeds rot in the soil or the first tap root rots off. The tap root has brown discoloration and a wet appearance. Symptoms are often confused with herbicide injury. The problem is most often found in cold, wet soils. Infected seeds may not germinate and may be soft and over-grown with other fungi and bacteria giving the seed a fuzzy appearance and mushy feel. Plants that are infected after emergence will wilt with moisture stress. If the leaves are present, they just turn a gray-green color and then turn brown and die. These plants can be pulled from the soil quite easily. It may be important to use a fungicide for a year or two until you get basic soil conditions improved. Avoid planting seed with a high percentage of broken seed coats, because fungi can invade seed much easier and kill before the seed has a chance to sprout. Phytophthora root rot starts with wilting of plants, leaves turning yellow, and plants dying with leaves still attached. One of the best diagnostic symptoms is a brown discoloration of the stem just above and below ground level. The tap root will be a dark brown and the entire root system may be rotted. Poorly drained soils, compacted soils and heavy clay soils are where the disease is most commonly found. This fungus - like all the others - thrives in compacted soils because the aerobic bacteria numbers are too low to keep the fungi in check. These soils are also difficult to keep the Ergs up and the paramagenetism of the soil is usually quite low. Brown stem rot is another fungal disease that I see a lot of late during the growing season. This disease should be checked for beginning 10 to 30 days before soybeans mature. Take a plant and slit the lower 6inches to see if tissue is a nice white color or brown, Sometimes the browning color shows only in the nodes and not in the internodal tissue. This disease progresses much faster during cool weather and is suppressed by warm weather. Infected fields turn brown much faster in the fall - instead of a yellow green phase - suggesting an early frost. It is said that many growers blame a low yield on false causes, failing to recognize the real culprit. This disease is one of those that is not highly visible outwardly and you need to slit some plants to find the true problem. 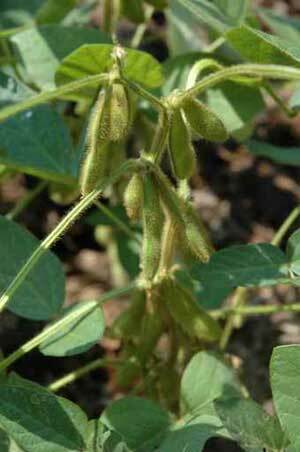 Fields with infected plants should not be planted to soybeans for three years. Brown spot is another fungus which affects the lower leaves of plants. The disease appears on the first pair of lower leaves in the spring. The leaves have brown to brownish-red spots at first, turning yellow and then dropping off prematurely. I have seen several fields of this and it really stunts growth for awhile and then plants grow out of the problem. Don't cultivate infected plants when it is wet because you can really spread the disease. Like all fungal disease, brown spot occurs in poorly drained soils and compacted soils with crop residue left on top. 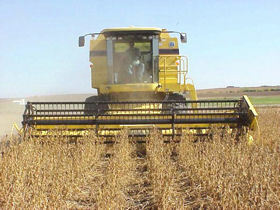 Universities recommend plowing under crop residue to control the problem. I wonder how this works with no-till programs that many areas are currently high on? I have covered a few of the soybean diseases that I have personally witnessed and there are more, but they all have several features in common. Nearly all of the fungal problems start in crop residue that has not properly decomposed into the sail, Secondly, most all are associated with compacted soils that have poor water circulation and air circulation. Get your farm started on a planned program to turn these problems around. For some of you that may even mean getting out your moll board plow. With a little planning you can break that yield barrier - reducing your cost to produce a bushel of soybeans.